Yesterday afternoon, students at Lane Tech College Prep High School in Chicago took to the streets outside to protest the school district's position on Persepolis. 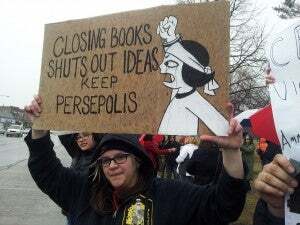 The acclaimed graphic novel by Marjane Satrapi, which details her own coming-of-age in revolutionary Iran, was ordered removed from schools and school libraries earlier this week, reportedly after an ordering snafu. It later turned out that story was false, and that the school district had actually moved to remove the award-winning graphic novel as a result of concerns about its content. After pressure from the public began to mount, Chicago Public Schools executives clarified their stance, saying that the book was to remain in school libraries, but would be removed from the seventh grade curriculum and placed "under review" for grades eight through ten. 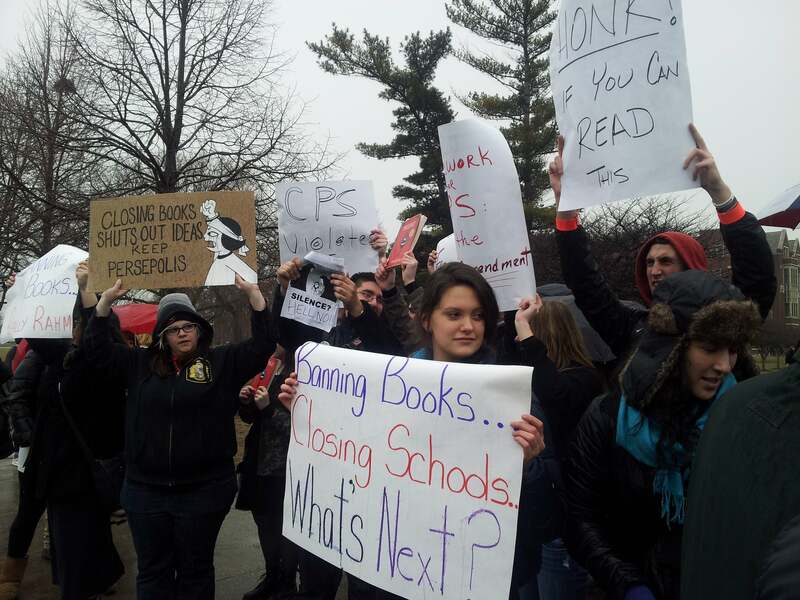 In response, a number of educational and free speech organizations have written a letter to the Chicago Public Schools to protest the decision, and a group of students at Lane Tech organized a protest in support of the book and in opposition to censorship in schools. "The teachers had their strike in the summer and they were heard," said Katie McDermott, one of the protest's organizers. "It's the students' turn to be heard." McDermott and Alexa Repp, another student who organized the protest with her, argue that district officials should have brought their concerns to the faculty and students rather than acting unilaterally. The book was reportedly removed due to its graphic depiction of torture and harsh language; Satrapi in a statement objected to that characterization of the work, saying that the torture in question was only a panel in the book. "There's a big difference between education and exposure," Repp said. "As long as [students] are being guided through the book, I don't see what's wrong with it." The controversy became public after someone from Lane Tech leaked a memo ordering the book removed from classrooms and libraries and turned in to district representatives to the blog of a retired educator. It was quickly pointed out that the Supreme Court has ruled books cannot be removed from public school libraries without due process. "I'm extremely proud of my students for standing up for their First Amendment rights," Steve Parsons, a social studies teacher who attended the protest, told the Chicago Tribune. "I tell my students all the time, this is what education is all about. You don't learn just so you can take a test. You learn so you can change the world. They are actually doing that now." You can check out more images from the protest below. All photos by Angelique Roberts and used with permission.